I have just become aware of a study from the New England Journal of Medicine that has traced 316 confirmed illnesses in 43 states to a mail order chick supplier. This hatchery supplied backyard flocks across the US. The NEJM estimated that there were thousands of unreported illnesses in the same outbreak. The illnesses were caused by the same strain of Salmonella montevideo. The article goes on to describe the interesting methods that the investigators used to discover the cause and course of the disease (think CSI, but in an agricultural setting….and with less attractive investigators, most likely). The story was interesting, but the bottom line is that a bunch of people got seriously ill from their day old chicks. 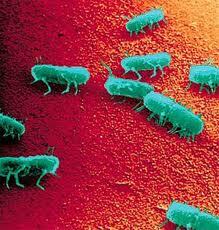 An Electron Micrograph of Salmonella bacteria. It is easy to forget that the cute balls of fluff can harbour seriously nasty bacteria. Salmonella are a common inhabitant of chicken’s intestines, and every egg and every chick has the potential to make you….or your kids….or your neighbours sick. I am not an alarmist. It is rare that chickens are a source of illness. Your Barred Rocks or Araucana or Black Copper Marin is not a ticking time bomb. However, you do need to be realistic and realize that your chickens and eggs are a potential risk. Professional egg producers spend a WHOLE lot of time and money maintaining food safety programs and hygiene. Backyarders need to keep a similar priority when handling their chickens and eggs. The general rules are easy, and intuitive. Keep manure and eggs separate. Wash your hands each time you handle your hens. If you wash your eggs, rinse them in running water, and don’t use hot water (it will cause the egg to expand, and when it contracts again, it can draw bacteria into the interior of the egg, where the bacteria can grow at an exponential rate). Keep manure out of your house (shoes dedicated to the coop and kept by the back door are a good, simple way to separate dirty and clean areas). Don’t allow your chickens free roam of your house…especially your kitchen….chickens will often have manure on their feet, or will inconsiderately leave droppings anywhere (and everywhere). Remember….the major source of dangerous bacteria is manure. The major vehicle by which it gets to your body is your hands. Do what you can to break the connection between these things. It is best if you develop some kinds of routines that you follow to maintain cleanliness in your eggs and house. It is worth reducing the risk to yourself and your loved ones. I read an article in a small agricultural paper here in Ontario. I haven’t yet put my hands on the book itself, but intend to as soon as I get a chance. The author, Maurice Hladik, discusses and puts some numbers on some things that I have known through my experience in modern agriculture. Many of you know that I am closely involved in modern agriculture, and am very supportive of the system that has developed over the past 50 years. I find it frustrating to see the misconceptions that are accepted as “fact” by the majority of urbanites who are not exposed to the realities of modern agriculture. I thought I’d share the article, and encourage anyone who is interested in where their food comes from to pick up this book. If you are not interested enough to read the book, at least feel confident that the food production methods in North America are considering the same issues you feel are important, and they are constantly changing their systems to meet the demands and values of the consumers they serve. – Small farms are disappearing. In fact the average farm size in the U.S. declined from 431 acres in 1997 to 418 acres in 2007 and the percentage of farms of 99 acres or less increased from 49.2 to 54.4 per cent. – Fertilizer use is increasing. In fact between 1990 and 2005, 17 per cent less nitrogen, 28 per cent less phosphorous and 20 per cent less potash was used to produce a bushel of corn. – Corporate farming is taking over. In fact the U.S. census found that 86.9 per cent in 1997 and 86.5 per cent in 2007 are owned by individuals or families. – Food miles matter. In fact, much less energy is used to move oranges from Florida or tomatoes from California than to drive the family car to a local farmers’ market or farm. The energy used to prepare a meal in the home is far greater than the energy used in transporting food. – The food system is broken. In fact, the percentage of the world’s people deemed malnourished declined from 33 in 1969 to 16 per cent in 2010 and the number of adequately-fed people more than doubled form 2.5 to 5.5 billion. – Organic foods are nutrionally superior. In fact, a thorough review of scientific literature published in 2009 in the American Journal of Clinical Nutrition found that organically-produced foods are not superior. Hladik says he has nothing against organic farmers, but he raises a lot of questions. For example, he wonders why so few organic farmers have been found guilty of cheating. He says it must be hard to resist the temptation to use pesticides to save a crop being devastated by insects or diseases, especially if inspections are infrequent and hardly any growers are decertified. He also provides a long list of pesticides that are acceptable to various organic organizations and wonders whether the public knows. Hladik makes a convincing case in favour of large-scale, modern farming methods. For example, only a farmer growing thousands of acres of grain can afford GPS technology, combines, tractors and no-till drills that result in greater precision, higher yields, reduced soil erosion and less pesticides and commercial fertilizers. The paperback book is available from Barnes & Noble, Amazon and iUniverse for $19.95 and in electronic form for $9.99.